Where in the hell did you get that? I would love a Timeghoul shirt! Honestly, that was the first place I looked and I noticed that, but those sizes are too big for me, and long sleeve is not my priority, especially now that it's just about summer in Australia. Still looks really cool. Im constantly wearing my long sleeves, my favorite is my white Repulsion one! 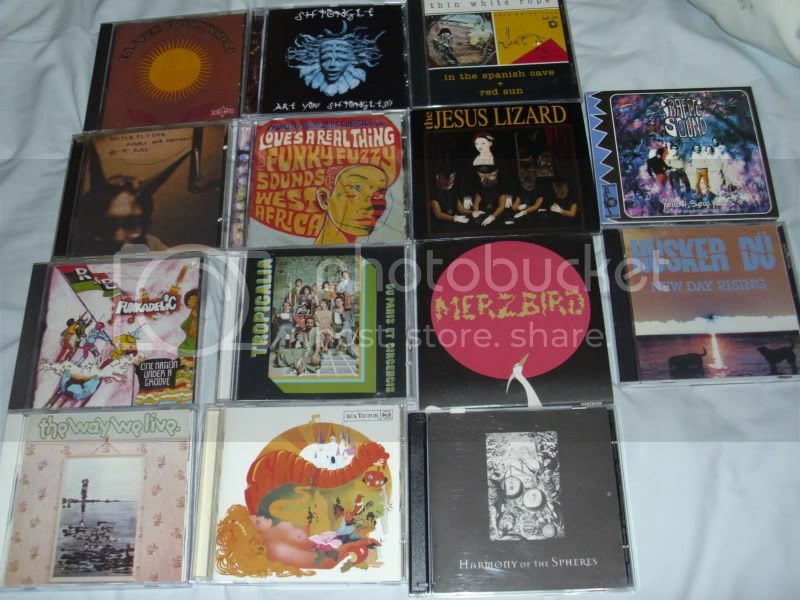 Merzbow- merzbird (also a free unexpected bonus, Masami Akita- The Prosperity of Vice, the Misfortune of Virtue cd was also stuck in the sleeve along with the merzbird cd. California Love - Post Mortem Emanations 7"
Low Places - s/t 7"
Damages - Love's Labor 7"
Sabaton - Carolus Rex, bought from the merch stand on their gig. Definitely fun, if not the heaviest thing on Earth. The kids love it, too. no kidding? i just got both of them last week myself, very cool albums. mine are reissued and remastered with cardboard sleeves. I have too many metal cds that I hardly ever listen to anymore just taking up space as is, really gotta sell some of them but too lazy. The only metal cd I bought recently was Nadja- Radiance of Shadows but it hasn't arrived yet. There are a few more classic metal albums I don't have yet but I already have almost all the metal classics otherwise. Dude, you bought New Day Rising. That's all you need . That or Zen Arcade. I'll take some off your hands, whenever you are willing to part with em. I've tried that argument before... Silence was the only answer I got. my ears pricked up when i read that, what a tease! It appears so, but I hope I'm not the only one on this board who has purchased this album thus far, as it is a beastly, classic Incantation album. It's seriously crushing, with some excellent riffage. And McEntee has really come into his own as a vocalist. Both albums are the original 92/93 editions on Alternative Tentacles, which means that "Cleanse" is going to last me some 26 minutes, eh. It's great to finally own the original editions, although it's a shame that EOTS is already showing some early signs of disc rot... Anyone else has this kind of issue on Alternative Tentacles Records releases? The SAZ CD is impeccable though. As an added bonus the mail man dropped me a package with the new Ataraxy and the Convulse reissue on CD. Damn, I have a bit of homework to do today! deja vu or was that the lp last time? Still hunting the ''Fire Walk with Me'' Lp. so are you going to treat us with a photo of all your cool twin peaks stuff? 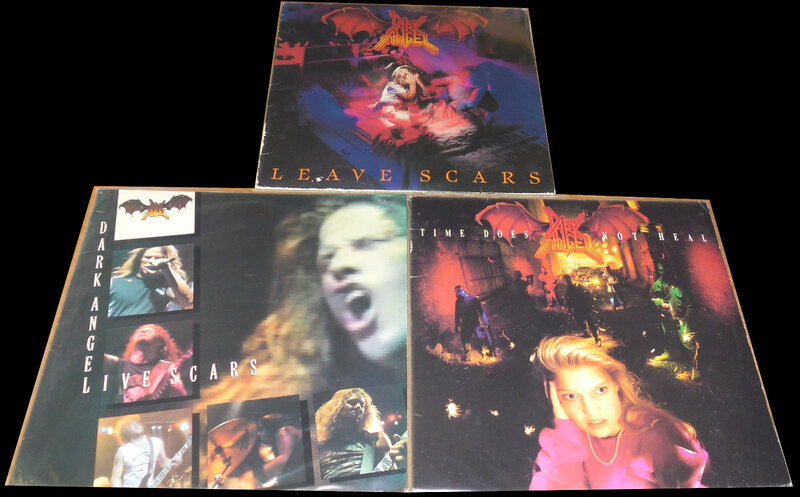 today i got in the mail, from our mate CrushedRevelation, Dark Angel - Leave Scars LP! so i now have 3 totally sweet dark angel lps, nice. do you know the cds i sent are there? did they contact you? ok so you're just going to check if they're there, cool. i get all nervous when stuff is out for delivery! Last edited by dreadmeat on Fri Nov 30, 2012 4:02 am, edited 1 time in total. Am I crazy, or did you say you didn't like this album? Last edited by CrushedRevelation on Fri Nov 30, 2012 4:11 am, edited 2 times in total. Ah, okay. I like that album, personally. Cool I didn't know this other cover existed. I wonder why they changed it? Does yours have edited bible pages as the inside cover?